You can have your application function as a provider to provide data to consumer applications by using the Tizen.Applications.DataControl.Provider class. To create a provider, you must export its provider functionalities in the application project settings in the IDE. You can have your application function as a consumer to access data shared by service applications by using the Tizen.Applications.DataControl.Consumer class. The consumer sends a request to the provider to insert, update, select, or delete SQL-type data, or to add, access, set, or remove map-type data. The provider processes the request and sends a response back to the consumer. For the consumer to access the data from the provider, it must know the provider ID and data ID. You can use a matrix cursor by using the Tizen.Applications.DataControl.MatrixCursor class. The matrix cursor helps you to create a cursor for a collection of data that is not in a database. 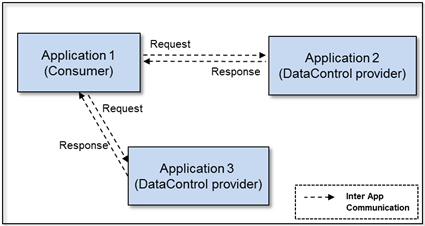 The data control use cases involve 2 applications. Each application plays a different role: one as the consumer, the other as the provider. For the provider, in Visual Studio, double-click tizen-manifest.xml, and in the manifest editor, go to Advanced > Data Control, and click Add to add the provider details. Add the Read and Write access rights to both SQL and Map types, as needed. You can set the data access to be trusted, allowing other applications signed with the same certificate to access the data. You can also define privileges to restrict access to applications having the specific privileges. In a provider application, you must override the following abstract methods of the Tizen.Applications.DataControl.Provider class for handling SQL requests: OnSelect(), OnInsert(), OnUpdate(), and OnDelete(). If you want to use Map-type data controls, you must override the OnMapAdd(), OnMapGet(), OnMapSet(), and OnMapRemove() methods. Optionally, you can override the OnBulkInsert(), OnMapBulkAdd(), and OnDataChangeListenRequest() methods as well. The applicable overridden method is called when a request is received from a consumer application. In a consumer application, you must override the following abstract methods of the Tizen.Applications.DataControl.Consumer class for handling responses to SQL requests: OnSelectResult(), OnInsertResult(), OnUpdateResult(), and OnDeleteResult(). If you want to use Map-type data controls, you must override the OnMapAddResult(), OnMapGetResult(), OnMapSetResult(), and OnMapRemoveResult() methods. Optionally, you can override the OnBulkInsertResult(), OnMapBulkAddResult(), and OnDataChangeListenResult() methods as well. If you want to override the behavior for when the provider uses the SendDataChange() method of the Tizen.Applications.DataControl.Provider class, override the OnDataChange() method. The applicable overridden method is called when a result is received from a provider. Add one row at a time to the matrix by passing either an array of objects or an Iterable to the AddRow() method of the Tizen.Applications.DataControl.MatrixCursor class. Define column types for a matrix cursor by using the values of the Tizen.Applications.DataControl.ColumnType enumeration. You can export the provider functionalities of your Tizen .NET service application in the application project settings in Visual Studio. The provider ID, type, and accessibility must be specified for the available data control. It must consist of alphanumeric characters separated with the period (".") character, and it must start with a letter. You can use Tizen .NET applications that provide their own data structure table and implement the SQL-type data control provider using a database file. You can use Tizen .NET applications that provide their own key-value pairs data structure map and implement the map-type data control provider using registry file or collection map classes. You can control read and write access from other applications by defining data control accessibility. Your provider application can restrict access to applications that have specific privileges defined. The following table contains an example data model of a data control provider.